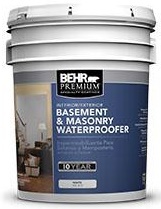 You need a water repelling product that soaks into the brick or stucco. This repels rain water but still allows the wall to breath to let out water vapor to allow drying. "511 Impregnator is the original penetrating sealer designed for the protection of all medium to dense porous surfaces. 511 Impregnator forms an invisible barrier that is resistant to moisture and stains while allowing vapor to escape".